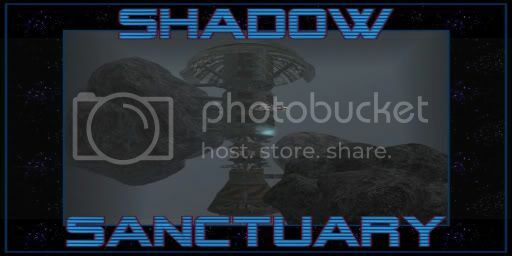 Sanctuary Shadowport is a Hutt-controlled fully mobile space station that serves as one of the most well-protected pirate bases in the Outer Rim. Hyperdrive-capable and heavily armed, Sanctuary provides a save haven for smugglers, gun-runners, slavers and other scum of the Galaxy that require a freeport that remains off the charts and out of reach of the authorities. Run and managed by Blorgus the Hutt and his army of salvaged droid workers, Sanctuary moves from asteroid belt to asteroid belt across the Rim, ancoring itself in place for months at a time before seeking a new location, always on the move so as to stay perfectly hidden, it's location given out to only the most trusted of Pirate captains. o) RCS is the combat meter we use here, however it is not a requirement, only if you wish to engage in metered combat. o) You must have a STAR WARS AV. There are plenty of races that you can choose from, just look it up on Wookiepedia. This is Star Wars, dress the part. o) These are IC Sims. If you must talk OOC, talk with brackets or the OOC tag. But please try to have OOC conversations in IMs. No mixing OOC with IC. o) No bad mouthing, complaining, negative vibes, interrupting rp with your OOC drama will get you banned for a couple days. o) No Godmodding - Being indestructible, using information IC gathered OOC, etc. Do not use Linden tags to retrieve another character's name. If you don't know the character, you have to ask for their name. o) If there is a problem with an RP, do not attempt to fix it yourself or void it. Ask for a GM or Administrator. Show Respect to Gms, security and Administrators. o) No kind of ammunition other than 'Damage' or 'Training' bullets is permitted. This includes but is not restricted to; Explosive, Gas, Incendiary, Orbit, Push, Cage, Blitz and Crush. o) Do not use tracking or “sticky” weapons. This include anything that can automatically target an avatar rather then having to manually aim, or anything that sticks to an avatar once it hits and continues to do damage (DCS HUD powers are the obvious exception to this). o) Do not use more then one weapon at a time, except weapons which do no extra damage i.e. dual lightsaber etc. o) You may not attack while cloaked, either by invisible prims or animations. o) Do not teleport into or out of combat. o) Do not teleport friends/allies into or out of combat. If you require support, you must roleplay calling for backup and have your friends arrive by legal means (i.e., they must walk or use a ship). o) Do not use RCS block and a ranged weapon at the same time. o) Do not have a melee weapon and a ranged weapon drawn at the same time. o) Do not reset your RCS. o) If a RCS person wants to get involved in a FFC fight they must declare they are going FFC and must stay FFC until the end of the RP situation no switching back and forth to avoid combat. Otherwise they must stay out of the FFC fight. o) Once you engage in RCS combat others do not have to RP in order to enter the fight, however they do still need a RP reason to engage. IE you see an ally being attacked you join the fight to protect them. Seeing someone being attacked and deciding to randomly attack one of the combatants is not permitted. o) Standard explosive grenades are the only kind permitted. o) When your RCS health reaches 0%, you are effectively incapacitated for the remainder of the fight. You may not continue fighting, move or interact with other combatants until the fight is complete. o) While wounded you must RP as your character being incapacitated, absolutely no combat and you cannot simply walk around perfectly fine your confined to medical. Or go OOC or switch to another character. The time period for being 'Wounded' is 12 hours. However, if you receive medical treatment within 5 minutes of entering the wounded stage, this time is reduced to 6 hours. This is the minimum requirement for role-playing as being injured, you may of course remain in an injured state for as long as you think necessary for the injury, you must however take your 6/12 hour time as standard. o) Avatar flight outside of combat may only be conducted with a canon source of locomotion, e.g., a Jet pack. You may fly for a maximum time of 30 seconds, and you may not exceed 200 meters in visible height with a single flight. And the flight must be believable, I.E. you could not use a jet pack to get to a ship or other planet in "space." o) If you are engaged in RCS combat, you may not use any kind of teleport, flight or non pre-rezzed vehicle to 'escape' (you may not rezz a vehicle to escape, you may use one that was rezzed pre-fight, however). You must either run until your opponent cannot find you, or fight back.